Although this blog hasn't been active since August of last year, it's amazing to see that it still has a Google Page rank of 5 and an Alexa Rank of 1.5 million or thereabouts. I guess the site still attracts many viewers from outside the UK. My other site jeremyjacobs.com has a Google Rank of currently 4 and with an Alexa Rank of under 300,000. Corporate Presenter will remain up here at "Blogger" but all new blog posts about being an event host , presenter or speaker and business matters can now be viewed at my other website. Last week, I was invited to a football-related business ethics forum. About 100 people attended. On the panel were David Dein, the former Arsenal FC director and Nigel Layton, Managing Director of Quest. In the chair was Mihir Bose, Sports Editor of the BBC. Mihir Bose, as you would expect from an experienced sports reporter and presenter, was superb. He was very even-handed with the speakers, injected the right amount of humour and organised a very slick Q&A session. Last year a link was posted on this site to Lisa Braithwaite's blog. She was discussing the pro's and con's of using a lectern. Just recently her post was mentioned here. Take a look at the video. Tips On How To Begin Your Presentation. Depending on the type of audience and situation one is talking at, there are many ways to start a speech or presentation. Speaker Jason Peck outlines some of the best techniques for those occasions. Ed. Another way is to start your speech with "the middle of your speech". Then do your introductions after a minute or so of content. This "delayed-drop" method can be effective. 1. When you go to a meeting or you are listening to a presentation and you don’t quite understand what is being said, post a Tweet asking your question. Seconds later you will have several replies, without ever needing to have interrupted the speaker or broken the flow of the presentation. 2. If you are going to a new town, or you are in a different location to normal, ask if people have recommendations of where to eat. Someone will answer – and you may even find you have a dinner date as well...! 3. Need to make quick notes you can access later? Tweet away. Set up a second Twitter account and send “direct” messages to your main account. That way, when you get back into the office you’ll have your list of notes already for you. 4. By posting regular hints and tips on your particular subject, you’ll get more visitors back to your web site. A daily tip in 100 characters and then a link back to your web site will really start to build your traffic. 5. Start following famous or respected people in your field. They may follow you and you will also be able to see who they follow. In this way you will become associated with the thought leaders on your subject. 6. Set up a regular search term for Twitter content. Then look at the Tweets, click through to any links and comment on the articles. This will provide you with relevant links back to your web site, helping your search engine ranking. 7. Customer service messages is another great way of using Twitter. You can keep customers informed, minute by minute if some aspect of your service is in crisis, or needs attention. Often people complain that they were not kept informed – Twitter helps you ensure you achieve better communication in times of crisis. 8. Use Twitter to give your business personality. Some of the most successful businesses in the world are where people “know” the boss – Virgin, Dell, Microsoft, Ryanair. Most companies, though, are faceless. Twitter helps you put personality into your communications, bringing you more attention. 9. Follow journalists and then send them direct messages with announcements of your press releases. You may pick up some offline public relations in this way. 10. Search for problems your customers experience. Your clients may discuss their gripes with your products and services. Search for their Tweets, respond and build relationships. It's rare for this blog to promote goods and services but this caught our eye. There are some useful tips mentioned here about becoming a tv presenter. Graham Jones recently wrote this article about how to use Twitter. You may agree that "engages me" and "helps me" are the two most important. These rules could easily apply to your blog, Facebook page or website content. A micro blog of 140 characters (this includes spaces), so one sentence. Keep it short and sweet. I would recommend you aim for about 130 characters so that there is enough space for people to quote you. 80% Free info and advice from either you or linked to great articles you know. How many people follow you or that you follow is actually fairly irrelevant! What is important is who is reading the tweets. I would recommend you follow the top people in your area of expertise. Comment to them using the reply arrow. This will mean that @ sign along with their name appears in your update box and you type in your reply. If you are quoting someone then it is courteous to put RT then a space and then @name and then simply copy their tweet and paste. Remember when someone replies to you with a comment their followers see it. This is how you build your online Twitter profile. 1) Tweetdeck. It is a small download. It sits on your PC and allows you to update your twitter account, filter all of the people you’re following, reply to people, and perhaps most importantly search. One of the key things about using tweetdeck is that you can search on keywords. These are the keywords that anyone in the twitter universe is using. 2) Twellow. Twellow allows you to search for people to follow. These can be based on geography, type of work etc...It is critical that you follow people. People rarely follow people, if they see that you are not following others. 4) Tweetlater. Tweetlater allows you to automatically follow others, simply because they followed you. It also allows you to send out tweets at times when you are perhaps away, doing other things. So you can seem to be updating, but you are on holiday. If so, you may want to personalise your Facebook URL. But you'd better hurry up! Quite a few businesses like to send out literature before starting an intense cold-calling campaign. In this article, I am going to advise how to go about making a follow-up call after an advertising mail-drop. Explain why you are calling, that you are following up on a mailing that was recently sent out. Do not ask them if they have any questions on the mail-out, or if they have read it as it could lead to embarrassment for the both of you. Give a short overview of your company and what you do. Interject pieces of information about their own company and why literature was sent to them in the first place. How you can do business together. When the prospect starts to ask leading questions, now is the time to book an appointment. Explain that to answer their questions, you would need to know more about their business and that you are free at such-and-such a time to pop in. Perhaps you could bring in lunch to discuss it? Do not ask them what date would be good for them as it is likely that no date is good for them. They are busy people. You need to MAKE the time yourself. This is why suggesting to bring in lunch is always a good idea as it is not only an incentive for them to meet you, but it is a great way of building rapport. After all, what is more intimate than eating a meal with a prospect? It can be far better for your chances than just a straight-forward sales meeting. It adds not only warmth to your meeting, but gives you an edge over your competitors. “When something will help me, make me money or improve my personal or professional development then I can honestly say that I don’t know what the word ‘busy’ actually means?” – Mr. Coldcall. Have you noticed that there are days when it feels you only ever get through to voicemails? And no-one ever wants to leave a message on voicemail do they? I mean, it isn’t like they will want to call you back, is it? Who would dream about calling back a sales-person or an aspiring tv presenter or public-speaker? Well actually, they might depending on the message you leave. You need to word your message carefully to spike the prospect’s interest. Make sure to put your personality in your call, make it as much fun as possible, and be interesting and positive. Remember to speak as if you were talking to a friend. After all, they have called YOU, you are in charge of the conversation and you want them to desire to continue talking to you, don’t you? Always make sure to keep a note of voicemails you have made, so that when the call is returned, you know exactly what was said, and you are not left unsure of what you are doing or saying. It is also a good idea to keep a note of interesting facts you have seen on their website, so when they are telling you about what they do, you can interject and ask relevant questions or make interesting points. Be fearless in your cold-calling, and you will find success beckons you. Don’t cut marketing – re-engineer how you market. If you stop marketing people may conclude that you are next in line to become a recession victim. Competitors will increase their presence – simply by you not investing in yours. Shake up your traditional marketing mix by becoming savvy to new ways of reaching niche markets – even extending to radical approaches such as guerrilla marketing. Spend your money wisely and allocate your budget shrewdly. Stop separating PR, marketing, sales promotions, the web and so on. Test new media in stages. Include your end-market through Web 2.0 initiatives such as blogs and marketing through social networking sites. Stop pushing people away. The ‘us’ and ‘them’ culture is dead. Be inclusive. Make the most important people in your chain–customers and clients feel valued by being part of a bigger brand experience. Like you, they want to be heard and acknowledged. Everything is possible – providing it doesn’t compromise your brand’s sense of integrity. Brand guru and author Jonathan Gabay, author of Soultraders, explains how re-branding works in an interview with BBC Radio Ulster. Click on the BBC link here. Jonathan Gabay, author of Soul Traders, outlines how politicians manipulate the media. Easy. Just emulate Geoff Burch. Just how effective are you? You may find this article of interest if you want to be a little more effective with your time. Ed. Some years ago when I ran a sales team, I would occasionally explain the difference between motion and progress! "Laughter, the best medicine" is a well-known phrase from the Readers Digest magazine. Next Sunday's world-wide celebrations for World Laughter Day is an opportunity for all to join in and feel better in doing so. If you haven't investigated communication tools like Twitter, Facebook and Linked-In then now could be a good time to do so. All three (and of course there are others) can help you connect with colleagues or customers and assist in developing your business. Before you start pushing ahead and capturing "followers" on Twitter or "friends" on Facebook ensure that you have a plan of action. Research what the social media experts suggest, read blogs on the subject, then follow a carefully defined method of building your social media profile. 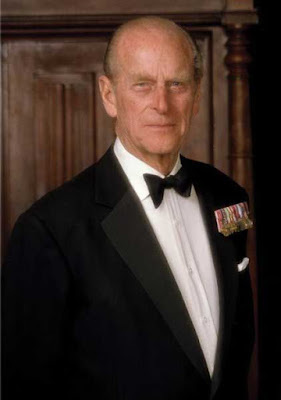 Prince Philip makes it a record as a consort.